Flour is powdered cereal grains, roots or seeds. Flour is made by milling flour, which means to grind the grain between steel wheels or stones. When you purchase stone-ground flour, this means the flour was milled specifically between stones. White flour is simply flour that has been bleached with a whitening agent. Semolina flour is coarse flour made from durum wheat which is rougher than wheat used for white flour. White flour actually refers to several types of flour: plain flour doesn’t have a leavening agent and is also called all-purpose flour, self-rising flour has a chemical leavening agent (usually baking powder) added to create lighter baked goods and enriched flour means that nutrients which were lost during the refining process are added back into the final product. 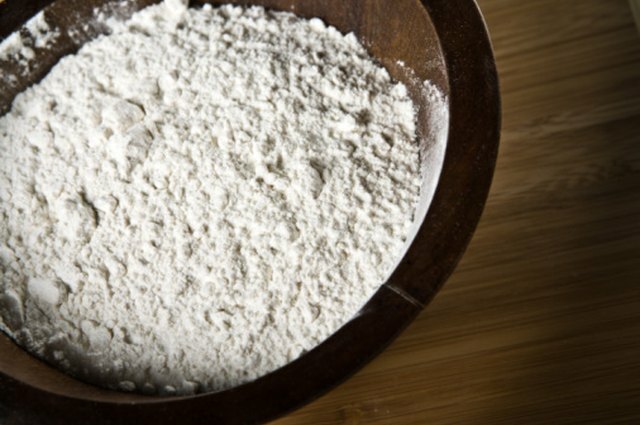 The white flour that consumers are most familiar with is made from wheat. White flour made from wheat can have high or low gluten content, depending on which variety of wheat is used. Semolina flour is made with grooved steel rollers. The rollers crack the starch of wheat kernels into coarse pieces which is then ground into flour. The starch is the semolina. Semolina is yellow in color and comes from a harder variety of wheat. Semolina has a very high gluten content and the flour has a substantial amount of protein. All-purpose white flour is the standard household flour because it is inexpensive. It can be used for a wide variety of baking and works especially well for cookies. Bread flour has a high protein content which is good for yeast bread breaking. Cake flour is, of course, used to make cakes. The flour has low protein, creating soft cakes and some cookies. Pastry flour falls in between all-purpose and cake flour and is used in muffins, pies and tarts. 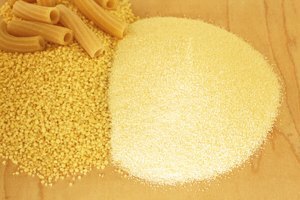 Semolina can be combined with durum flour to make couscous. The semolina is not ground quite as fine when processing couscous. Semolina is most often used to make pasta. The flour is sturdier than white flour, so it is better suited for pasta making. White flour on the other hand is not very resilient when used in pasta. 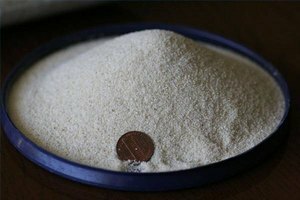 Semolina flour, when used in pasta, also holds its shape in water. You can sprinkle semolina on a baking surface to prevent sticking. Halvas is a popular Greek dessert made with semolina, sugar, butter, milk and pine nuts. In northwestern Europe and North America, semolina is sweetened and boiled with milk to make a pudding. In Scandinavian countries, semolina is served as a breakfast porridge.